No, “Black Panther” isn’t the greatest movie ever made. It’s probably not even the greatest superhero movie ever made. But it’s very, very good — in its best scenes, exhilarating. Just as important, it’s a breakthrough in an entirely new direction: a smart, propulsive action fantasy starring a hero of color leading a strong, unbowed nation of color. The movie doesn’t reinvent the superhero genre so much as reclaim and reenergize it — archetypes, cliches, and all — for viewers hungry to dream in their own skin. That’s why its arrival feels like a cultural inflection point and a cause for exultation in some quarters. Made with punch and conviction, “Black Panther” has the pop power that can rise from a long time coming. The film doesn’t feel like the usual corporate franchise contact high but, rather, the work of a singular sensibility, that of director/co-writer Ryan Coogler. The Oakland-born Coogler has steadily worked his way out from his home base, debuting with 2013’s stark “Fruitvale Station,” about the 2009 police shooting of Oscar Grant, then jump-starting the “Rocky” series by telling it from the other side of the ring in “Creed” (2015). Now he has been handed the keys to the Marvel kingdom. He has triumphed, but with a property ready-made to carry weight and resonance. Created in 1966 by Marvel’s Stan Lee and Jack Kirby, the character of Black Panther is actually King T’Challa, ruler of the fictional African country of Wakanda. Situated atop a bedrock of all-powerful vibranium, Wakanda has developed technology that positions it far ahead of the rest of Earth — flying cars and everything — but to protect its people from colonial predations, the country’s rulers have cloaked their cities and marvels behind invisible shields, the better to pose as “just another” Third World nation. That’s an incredibly powerful what if — an alternate history that end-runs centuries of enslavement and exploitation — and Coogler builds it into his movie’s very bones. Hannah Beachler’s Afrofuturist production design for “Black Panther” brilliantly interweaves gleaming digitized machinery with the riotous colors, patterns, landscapes, and rhythms of sub-Saharan Africa. The cinematography by Cambridge-born Rachel Morrison (Oscar-nominated for her work in “Mudbound”) vividly captures and contains the multiplicity; a fine soundtrack, curated and performed by Grammy winner Kendrick Lamar, bounces between rap, nu-soul, and classic Afro-pop. 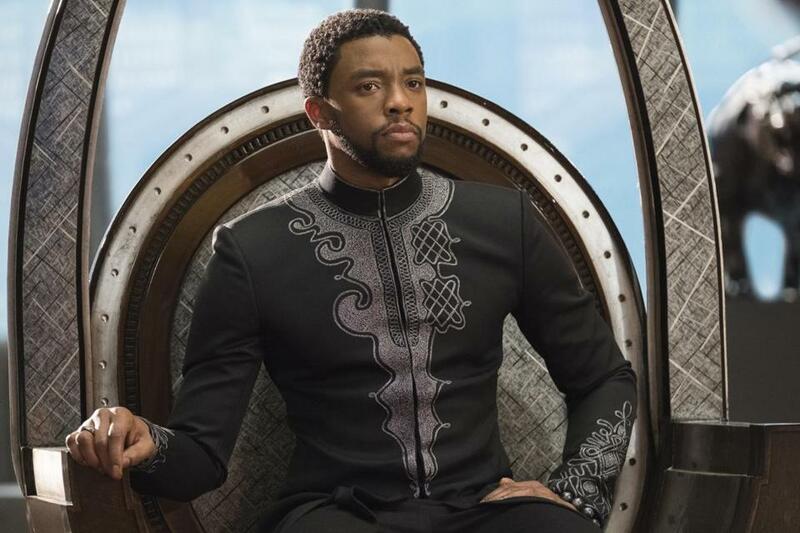 As the movie’s hero, Chadwick Boseman moves with the regal assurance of a born king. Boseman has previously played Jackie Robinson (“42”), James Brown (“Get on Up”), and Thurgood Marshall (“Marshall”). “Black Panther” at last allows him to be a movie star on his own terms, both in and out of the sleek ebony nanotech cat suit. But Coogler fills the screen with strong personalities and performances. Daniel Kaluuya, of “Get Out,” and Winston Duke play Wakandan noblemen with their own agendas and allegiances. Forest Whitaker is the aged adviser and totemic shaman, schooled in the sources of the king’s power. As a helpful CIA agent, Martin Freeman (“The Hobbit”) is the film’s token white good guy (try that on for a change), and Andy Serkis slips out of his usual pixels to play a rollicking nasty named Klaue. But it’s the women in “Black Panther” who make the difference, and the villain who brings it all home. Angela Bassett plays T’Challa’s mother, the majestic Queen Mother, and Lupita Nyong’o finally gets a worthy follow-up to “12 Years a Slave” as Nakia, successfully fighting against the hero’s-best-girl straitjacket. The young Letitia Wright is delightful as Shuri, T’Challa’s tech-genius little sister (she’s basically this movie’s Q), and Danai Gurira (“The Walking Dead”) brings a glowering ferocity to General Okoye, leader of the King’s all-female warrior bodyguards. Okoye is as much at the center of the action sequences as her boss, and Nakia and Shuri get their licks in, too; “Black Panther” says it takes a village, a nation, and all the women in your life to fight through obstacles. Just in case you were worried, Coogler aces the foot chases, car chases, shootouts, and fistfights, and because the movie’s so rooted in character — in the characters’ self-possession and self-worth — the mayhem carries an extra fizz. The movie feels of a piece, and it feels proud. That pride co-exists with Coogler’s awareness that a real, non-Wakandan world of struggle, intolerance, and unimaginable cruelty hovers just beyond the frames of his film, rarely confronted head-on but always somehow present. 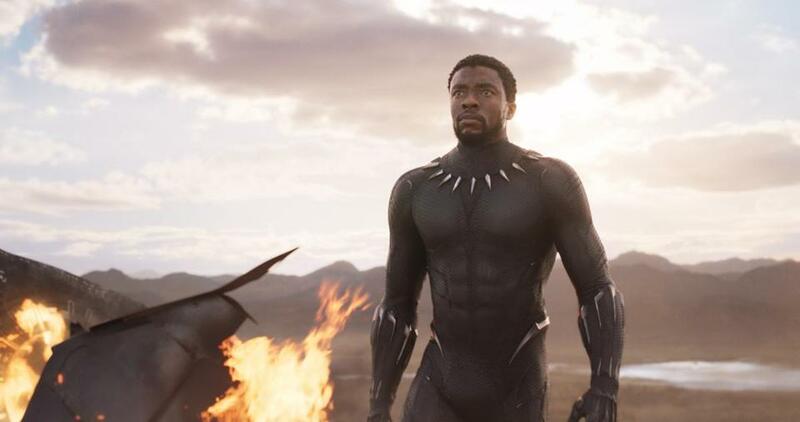 That struggle and its psychological toll explain the hatred festering within the movie’s strikingly complex villain; their lack suffuses the Wakandan characters with a strength — a wholesale freedom from America’s crippling racial neuroses — that carries a deeper thrill than comic books tend to convey. Killmonger wants to steal Wakanda. Jordan, as a swaggering anti-hero whose tragedy grounds “Black Panther” in lived pain, just about steals the movie. When all is said and done, “Black Panther” sticks to the rules of the genre. The comic dialogue is sometimes forced (but mostly not), and you can pick the pieces that come from the Joseph Campbell playbook and other mythic/pop-culture sources all you want. Directed by Ryan Coogler. Written by Coogler and Joe Robert Cole. Starring Chadwick Boseman, Michael B. Jordan, Lupita Nyong’o, Danai Gurira, Letitia Wright, Daniel Kaluuya, Martin Freeman. At Boston Common, Fenway, suburbs; Jordan’s Furniture IMAX in Natick and Reading. 140 minutes. PG-13 (prolonged sequences of action violence, a brief rude gesture).